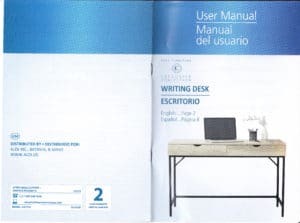 Aldi is selling a similar desk in 2019. 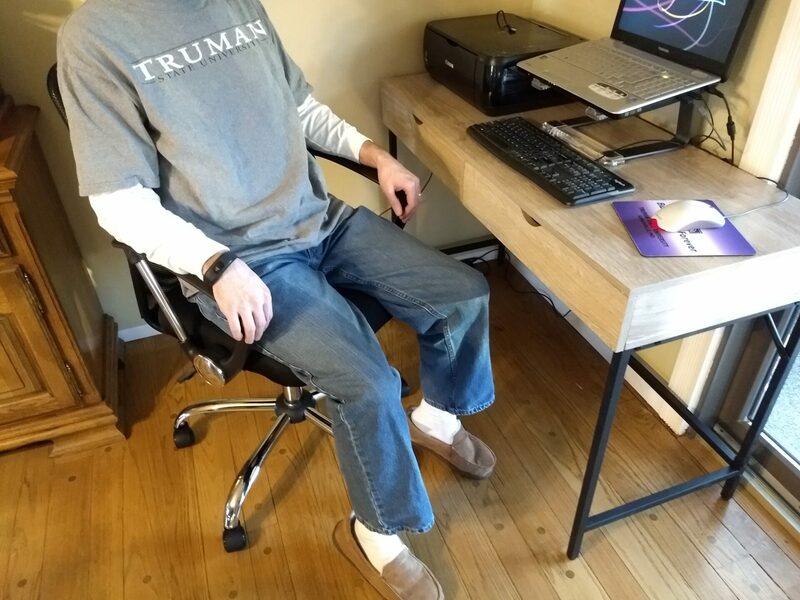 The biggest differences between the 2019 and 2018 models of the desk are that 1.) the 2019 model has an outlet and USB ports and 2.) the 2019 model is $10 more than the 2018 version ($69.99 compared to $59.99). 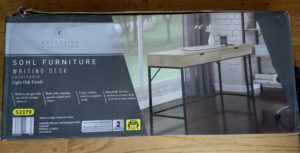 Check out our review of another desk that Aldi sells, the SOHL Furniture Life Concepts Folding Computer Desk, here. 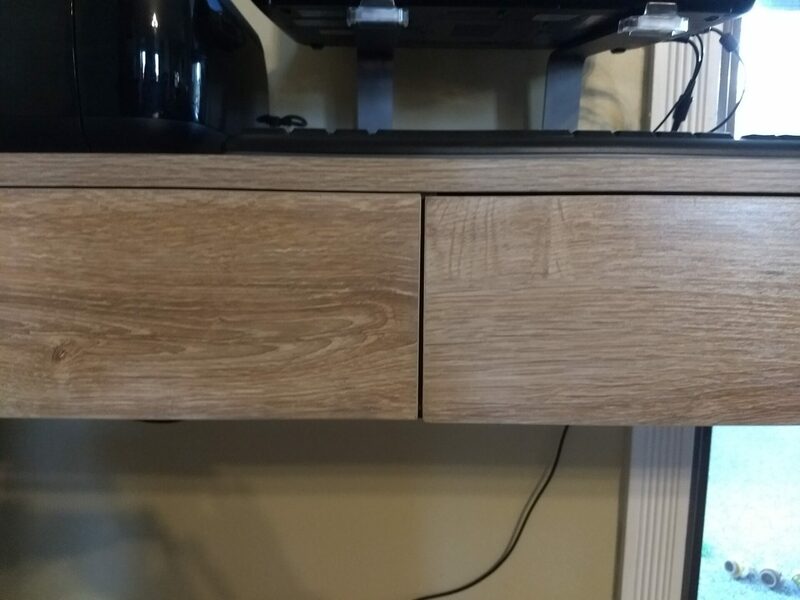 If you’re seeking information on warranty service for the SOHL Furniture Writing Desk, read more about our experience here. I work from home, but I haven’t had a truly suitable office space for several years since we converted our home office into our youngest child’s bedroom. My work space options have included working with my computer on my lap in the living room or (during mild weather) in our sun room, working at the dining room table where I have to clear everything off at the end of the day so I can serve dinner, or working in our guest bedroom in the basement where we moved most of our office furniture after my youngest child was born. I don’t really like working in the basement, as it’s rather cave-like and I prefer working near a window to the outside world for morale boosting and motivation. Enter the Aldi SOHL Furniture Writing Desk and accompanying SOHL Furniture Mesh Office Chair. 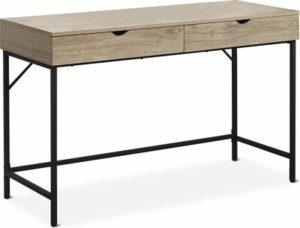 Aldi is currently selling this desk for $59.99, and the office chair for $39.99. I’ve seen similar desks at Target for just over $100 and mesh chairs for $120, so from a price perspective these are pretty cheap for what you get. Aldi also is selling a shelf set that matches the desk, but I didn’t purchase the shelf. 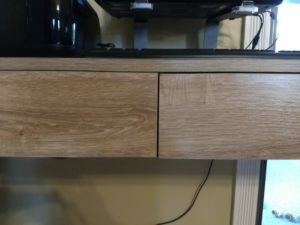 This desk has a light oak finish with two storage drawers. It advertises that it’s made with a durable powder-coated steel frame, and it has adjustable levelers on the feet to ensure a level work space on any surface. The desk measures 47.2 inches long, 18.8 inches deep, and 30.2 inches tall. The chair offers contour support, a breathable padded fabric seat, upright locking position, adjustable tilt tension control and seat height, and 360-degree swivel wheels. It has a weight capacity of 275 pounds. I did ask for help getting the desk loaded into my car. It is heavy but not impossible to carry, but the box recommends that two people carry it. An Aldi employee was happy to grab the box the desk was packaged in off the shelf in the store. He balanced it in a shopping cart and brought it to my car for me. The desk comes with the wooden surface and drawers already assembled in one large unit, and all I had to do was attach the legs and supports. 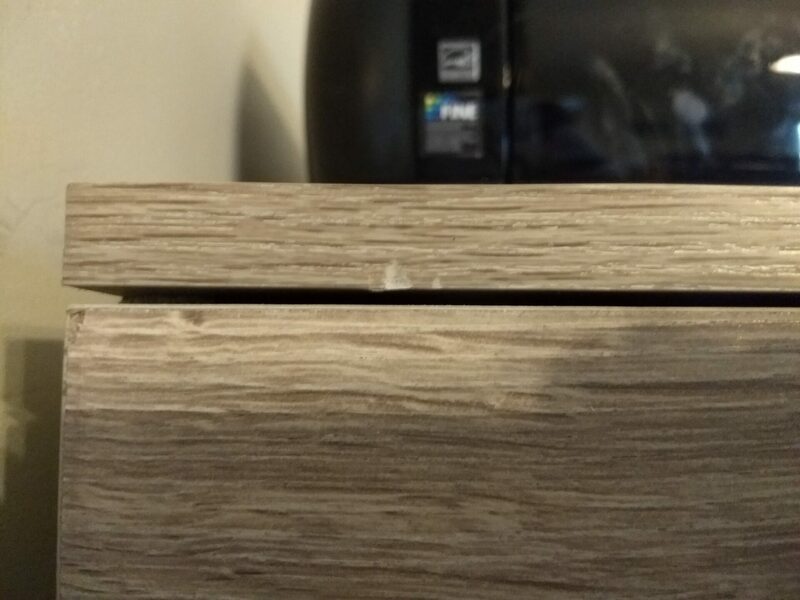 I noticed that the wooden portion of the desk had several small gashes when I removed it from the packaging, including a significant dent on the lower right corner of one of the drawers. These issues may simply come with the territory when purchasing a $60 desk. The wood (or whatever it is) is probably not the greatest quality. It’s possible that — because all the dents are on the front surface of the desk — the damage may have happened all in one blow to that side, depending on what happened to the box during the shipping process. None of the dents are deal breakers for me because most of them aren’t that noticeable, but I am going to contact the manufacturer to request a new front facade for the drawer with the largest and most conspicuous gash. The other small dents can’t be repaired without getting an entirely new desk, and they don’t bother me as much. It took about 30 minutes for me to assemble the desk, and it took my husband about 30 minutes to assemble the chair. 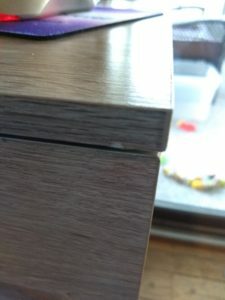 Both pieces of furniture came with a hex screwdriver for assembly, but the desk requires a screwdriver with a Phillips head as well, and we preferred to use our own screwdriver that has hex attachments. The desk doesn’t have written instructions for assembly: only a series of pictures. It looked intimidating at first, but after studying the manual I figured it out easily. I had to ask my 10-year-old to hold the stabilizer bar that runs under the desk while I screwed it in, so it does require a second set of hands for part of the assembly. 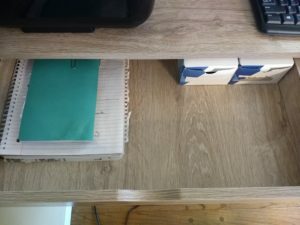 After assembling, I noticed that the right desk drawer sits very slightly lower than the left drawer, but I figure I got what I paid for and few people will notice it. Also, the bottoms of the drawers don’t feel the sturdiest, so I’ll have to be careful not to overload them with heavy items. The inside of one of the drawers. I’ve got a few notebooks and some boxes of business cards stashed here. My husband said assembling the chair was generally painless. It can be done with one person, but it’s helpful to have a second person for portions of the task. There was a typo or missing element in the labeling of the spacers. They were labeled A and B in the instructions but were not labelled on the inventory list, so my husband had to guess what the right ones were. We ultimately guessed correctly that the first spacer listed was the A spacer. Our initial takeaway is that the desk and the chair are similar in quality to what you’d buy at a big box store. They’re not top-shelf furniture, but they definitely work, especially for the price. The chair, in particular, is both comfortable and contoured well. The back support is especially nice. As for the desk, it has space for my laptop with its accompanying stand as well as a separate keyboard and mouse. I also fit our home printer onto the desk, but that really crowds the space, leaving little surface area for a cup of tea or a lamp. It works for my purposes, though. Best of all, I now have my own dedicated work space with a view of the birds at the feeders in my back yard. 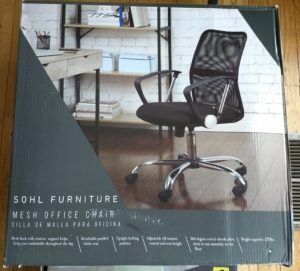 Aldi’s SOHL Furniture Writing Desk and SOHL Furniture Mesh Office Chair are what you might expect of a $60 desk and a $40 chair. The desk looks nice and provides a good-but-not-huge work space, and the chair is comfortable. However, this is probably not heirloom-quality furniture meant to last forever. The wood on the desk is inexpensive and came out of the box with several small dents. (Check back later to see if I score any replacement pieces from the manufacturer.) Considering that similar desks and chairs from big box stores easily cost $100 or more each, though, the Aldi desk and chair are a good deal if you need to create a work space on the cheap. I’m curious how sturdy the desk is with metal legs instead of wood? Ours has been pretty sturdy. It doesn’t move much and we don’t have many worries about the printer, laptop, and other things we’ve put on it. 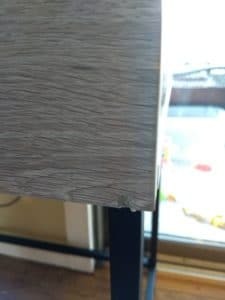 What is the height of the legs of this desk? I can see the tabletop height. I’m trying to figure out if I can put it over my dog’s kennel! It’s about 24 inches from the floor to the metal bars under the desk.